Batch Entry is very useful. 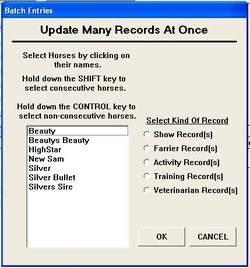 When you have to input the same information for a number of horses, use the Batch Entry feature. For instance, if the Vet gives shots to 10 horses on one day, you do not have to enter the Vet visit 10 different times. By using the Batch Entry feature, you record the Vet visit, and select the horses that apply to the visit. The Vet information will automatically be added to each horse. Once you have entered all the information, just hit the OK button and all the information is saved. HorseBiz utilizes an Address Book to maintain contact information. be placed in multiple Groups. Address, phone number, business address, home address and email can be maintained on the different tabs. To Edit a Contact, click on File/Edit Contact and make the appropriate changes.